Visualize an iceberg; what you see above the water are these quality of life challenges or issues millions of citizens face every day. Even as our governments remain pre-occupied with Band-Aid solutions to the visible issues on the surface beneath the surface lie the City-Systems that are often ignored and unaddressed. 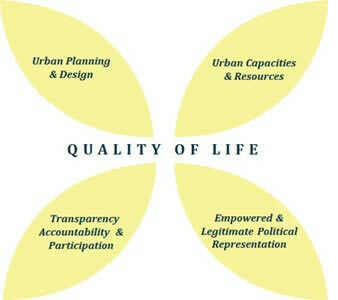 Janaagraha proposes to form a pan-India network of organizations working in the area of urban governance to collaborate on "Transforming Quality of Life in Indian Cities and towns". 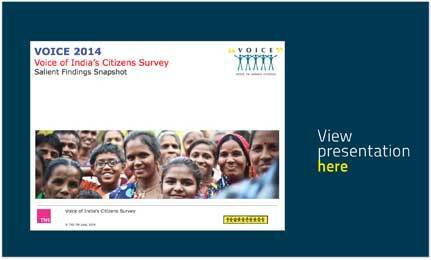 Janaagraha's flagship advocacy initiative, the Annual Survey of India's City-Systems (ASICS) covering 21 largest cities in India, will form the cornerstone of the intervention's engagement strategy with decision makers. 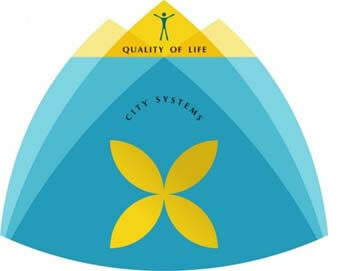 ASICS is a comprehensive diagnostic of the state of India's city-systems based on Janaagraha's City-Systems framework. It is intended to serve as a bellwether of the degree and direction of systemic reforms being undertaken by governments in respect of cities. Through a collaborative approach that will leverage Janaagraha's expertise in governance reforms and involve city partners with local knowledge and expertise, the proposed Network will engage political and administrative decision makers at the Central, State and City level to advocate and implement systemic reform in each of the above four areas that make up the City-Systems framework. Through a collaborative approach that will leverage Janaagraha's expertise in governance reforms and involve city partners with local knowledge and relationships, the proposed 'City-Systems Reform Network' will focus on the 23 largest Indian cities* covered in the ASICS survey to engage political and administrative decision makers using ASICS findings, and advocate and implement reform agendas to improve urban governance. The 23 cities chosen include the capital cities of the 19 largest states in India and the next four largest cities subject to availability and ease of gathering data. The cities have been chosen for engagement to ensure the maximum traction in terms of advocacy. The cities have been chosen keeping in mind their political and economic significance. Though the recommendations for the reforms, would be based on the diagnosis of the state capitals, the reforms, in the form of amendments to Act, changes in policy and processes would be applicable state wide, since the laws and policies are framed at the state level. Therefore, though the network will primarily focus on the state capitals the reforms proposed and their impact would cover all the ULBs in the state. Given the long gestation period in implementation of systemic reforms, local partners are essential to ensure sustained engagement. City-systems reforms would require continuous engagement and advocacy with the local authorities and the state governments. Local organizations, with on ground presence, familiarity with local issues and who have experience and expertise in advocacy and engagement with local and state governments. Establish accountability frameworks in municipalities, civic agencies and state government departments dealing with cities. State level engagements through workshops, roundtables and conclaves to engage elected representatives (councilors, MLAs), city officials, Urban department officials of states, and other key stakeholders including business heads, citizen groups, CSOs, etc.